The first month of the year is already gone (already!?) and our team has been busier than ever. We started the year with great positivity and determination to pick up where we left it: continue to offer real solutions, which will accelerate the energy sector transition process and induce positive impact in people’s lives. We are about to burst into February and we have made some exciting plans. JAN 30 : Energy Revolution Congress – Valencia, Spain. The objective of the Congress is to analyze the opportunities that Spain has in a new political and regulatory environment regarding the energy planning of the country. – Public interested in how to produce and consume their own energy. Our CEO, Gerard Bel, will present Pylon Network to the audience of the congress and explain the importance of energy data neutrality for unlocking the true potential of the future (digitalized) energy systems and the key role that Pylon Network will play in this future, as an open, neutral management and sharing tool for settlement of energy-related data. Tickets and additional info, here. – The White Paper will define the most updated value propositions of Pylon Network and its future implementation/commercialization path in the energy sector. It is not intended to provide a detailed business plan. The purpose of this document is rather, to become the value-compass for the development of the project in the years to come and to reflect our vision about the key role that Pylon Network has to play in the future energy system, after one year of valuable interactions with international energy stakeholders and the invaluable lessons we took away from this engagement. From the numerous requests of our community during the past year, we know that both are expected with great anticipation. The wait has been long for us too: we cannot wait to share this information with you and hear your thoughts! Date To Be Announced: Releasing all details for MainNet Beta Program. This month keeps getting better! We will be launching our MainNet Beta Program and we will start by releasing all information about the stages, the scope and the participation requirements/restrictions. At the same time, we will provide more info about the purpose, scope and targets of the Beta Program. For successfully carrying out the Beta Program, we will require the help and participation of our community. Of course, incentive and reward programs will be in place. Note that participation will be granted after a selection process. But that’s all for now; stay tuned (and be a bit patient!) because exciting news are on the way! With the completion of the selection process, the Beta Program will be ready to launch. More info will be provided upon release of the participation details. 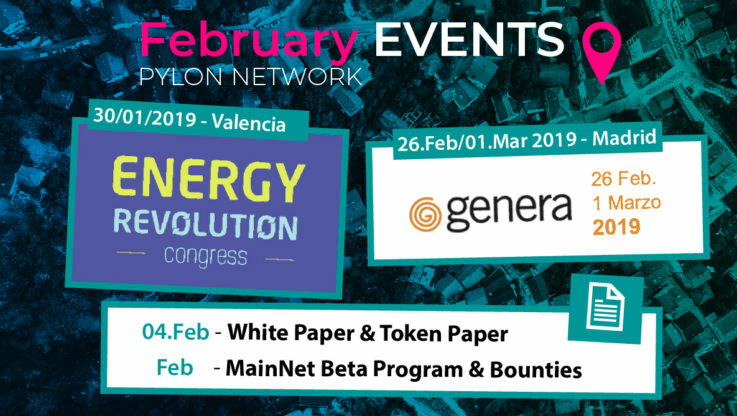 FEB 26 – MAR 1: GENERA Energia – Madrid, Spain. The Energy and Environment International Trade Fair, organized by IFEMA, is taking place in Madrid at the end of the month. The event brings together professionals, institutions and public organizations, from a large range of the energy sector and generation/sustainable technologies (Solar, Wind, Biofuel, Waste, Coal, Cogeneration, Energy Efficiency, Geothermal, Hydro, Hydrogen etc.). During the four days of the fair, Pylon Network will be exhibiting in the pavilion of IDAE, the Institution for Energy Diversification and Savings, which is supported by the Spanish Ministry of Energy, Tourism and Digital Planning. IDAE is also the main supporter of the event. The trade fair will offer us the chance to network intensively with important energy stakeholders of the Spanish sector and explore opportunities focused on both demo and commercial activities. Being selected by IDAE to showcase Pylon Network and our vision for the energy sector, is a big recognition for the project and the team of Pylon Network that will be there is already looking forward to engaging with like-minded professionals and institutions. Join the conversation and our amazing community on Telegram!